The following family history was generously shared with me by Hilary Streeter. She is not aware of any connection between this Frederick Thomas Anderson and the Frederick Anderson, son of Edward and Alice Anderson, commemorated on Southborough War Memorial. Frederick Thomas Anderson was born in 1884, and in 1891 was living at Modest Corner, Southborough with his father Thomas Adam Anderson, plumber and painter (born in Smarden, Kent), mother Alice and younger sister Minnie. 10 years later Frederick was working as Solicitors clerk (Law), and Minnie, aged 15, as Milliner’s apprentice. In 1908, Frederick joined the Territorial Force – 2nd London Heavy Brigade G.R.A. Four years later, Minnie died at the age of 26, and was buried in Southborough Cemetery. On 18 Nov 1914 Frederick enlisted as a Private in the Honourable Artillery Coy, 1st Battalion: TF. Regtl no. 2574. He was then working as Solicitor’s Clerk to Henry Thossop, 11 Lincolns Inn. London, and living at 24 Canonbury Street, London N1. He was posted to France from 1 Jul 1915 – 17 Aug 1916. He was in hospital in England from 18 Aug 1916 – Jun 1918, when he was discharged and admitted, aged 34 years, to Barming Hospital, Maidstone with ‘delusional insanity’. Frederick's mother Alice died, aged 78 years, in July 1931, and is buried in Southborough Cemetery. Frederick (53 yrs) died on 18 December 1937 at Barming Hospital from pulmonary tuberculosis. His father Thomas died, aged 86, on 20 Jun 1938, and is buried in Southborough Cemetery. What, one may wonder, was the reality of Frederick's life in Barming Hospital, for the nineteen years he was a patient there, presumably suffering from shell-shock, and never rehabilitated? How many of these tragic, broken men were still in mental hospitals until quite recent years? 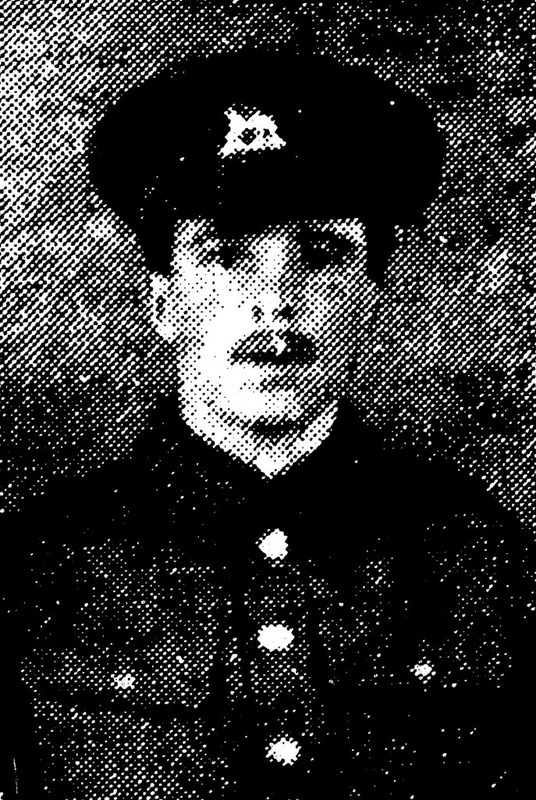 From the Tunbridge Wells Advertiser (clipping undated): Gunner AEJ Carden, of Forge Road, Southborough, was wounded by shell fire on the 26th of July. His wife visited him on Monday, and he is going on well. He is wounded in the thigh and hand. He had been in France 13 months. From the Tunbridge Wells Courier, 1 November 1918: Mr and Mrs Clapson, of 28 Edward-street, have received news that their son, Pte G T Clapson, is in the 12th Convalescent Camp, Boulogne, suffering from a gunshot wound in the left arm. Pte Clapson joined the colours in September, 1915, and has been in France two years. He was home on 14 days' leave last December. From the Courier, 1 November 1918: Private EC Eldon, son of Mr Eldon, of the Hand and Sceptre Hotel, was wounded in France on May 21st, a few days after his nineteenth birthday and a year after he joined up. He has two brothers serving. From the Courier, 18 August 1916: News has been received by Mrs Groombridge, 18, Holden-place, Southborough, that her son, Pte FG Groombridge, King's Own Scottish Borderers, has been severely wounded, the official description being that it is a gunshot wound, and the chest penetrated. Pte Groombridge, who was hit on the 30th July, writing to his mother states that he had been in three charges, and had reached the German trenches, when a bullet hit him in the back and came out of his chest. He was first admitted to the Australian General Hospital, Rouen, but has since arrived in England, and is now in the Auxiliary Military Hospital, Frodsham, Cheshire, and he says he is going on well. His father, Pte F Groombridge, Royal West Kent Regiment, was wounded early in the war. From the Courier, undated: Mrs Jones, 54 Meadow-road, has received information that her husband, Private WC Jones, Royal Sussex Regiment, is ill in the Battenhall V.A.D. Hospital, Worcester, suffering from septic poisoning and tonsilitiis. He has been serving in France about eight months. Private Jones joined the Army in June, 1916, and was only in training in England about three months before he was drafted to France, where he has been in the trenches most of the time. From the Tunbridge Wells Courier, 1 November 1918: Mrs Miles, of 18, Western-road, has received official intimation that her husband, Pte E W Miles, has been wounded in the leg by shrapnel, and is now in hospital at Exault. Pte Miles joined up in June, 1916, and was sent to France six weeks afterwards. He took part in the heavy fighting around Cambrai in 1917, and also assisted in the victorious advance of the Allies during the past few months. Previous to joining the Army, Pte E W Miles was gardener to Dr Guthrie, of Frant-road, Tunbridge Wells. He had been a member of the Southborough Fire Brigade for the past ten years, and was also a special constable. From the Tunbridge Wells Courier, 26 October 1917: Seaman A W Obbard, eldest son of Mr and Mrs Obbard, 3 Elm Road, Southborough, has been home on 21 days' leave, after leaving the hospital at Deal, where he has been an inmate suffering from the effects of being gassed, and shell shock. He has been twice wounded before, and he also holds the French Legion of Honour for bravery on the field. From the Courier, undated: Mr and Mrs Penticost, of 33 Bedford-road, have been informed that their son Pte Penticost, Royal West Kent Regiment, has been wounded in Egypt. Before joining the Army in 1915 he was employed in Hunt's Laundry. May 1918 - reports in both the Tunbridge Wells Courier and Advertiser: Official news has been received by Mrs Ridge, 43, Springfield Road, that her son, Private EH Ridge, Royal West Surreys, has been missing since March 23rd. At the same time as the above notice was received Mrs Ridge had information that another son (as reported in last week's Courier) who is lying wounded in Woking Hospital, has lost the sight of both eyes. Local medal-collector Martin Beevis told me that his grandmother used to loved next door to the brothers, and used to give them hot meals and do their housework. From an undated local newspaper cutting: Mr and Mrs H Simmons, of 29, Wolseley-road, High Brooms, have received official news that their third son, Pte N Simmons, of the Lancashire Fusiliers, was gassed at the Western Front on April 17th, and is now in the General Hospital at Etaples. Pte Simmons joined the R.E. in December, 1914, and went to France in September, 1917. Before joining the Army he had been employed at the Royal Kent Laundry for eight years, and was an old High Brooms School boy. Mrs Simmons has received a letter from her son, saying he is being well looked after, and going on well, and looking forward to coming home. Mr and Mrs Simmons have also received news that their fourth son, Pte WH Simmons, of the Yorkshire Light Infantry, was also gassed on the 29th of April and is in an hospital in France. Pte WH Simmons joined the R.E. in January, 1915, and was transferred to the Yorkshire Light Infantry when he transferred to the Yorkshire Light Infantry when he went to France with his brother in September 1917. Before joining up, he worked for the Photochrom Co, Ltd, Upper Grosvenor-road, and is an old High Brooms School boy. Mr and Mrs Simmons have another son in the Royal Engineers, and four sons-in-law with the colours, all in France. Another son-in-law was killed in France last September. Private Harold G. Tipping, 7th Royal West Kent Regiment, son of Mr and Mrs G Tipping, of 15, Sheffield-road, Southborough, has been wounded in the recent fighting. The nature of his wound is not known, as his parents have received only a field card from him saying he is wounded. He joined the Special Reserve in November, 1913, and was in training when war broke out. He has been at the Front about twelve months. Mr Tipping, who is himself an ex-Non-Commissioned Officer, has seven sons serving in the Army. A letter was received yesterday (Thursday) by Private Tipping's parents, stating that he was wounded in the leg below the knee, the bullet passing right through. He was coming out of the trench at the time. He is now in the General Hospital, Northampton, progressing well. Samuel Tilley, commemorated on the Southborough War Memorial, also serving with 7th Royal West Kent Regiment, and living at 13, Sheffield-road, wrote home on 15 July 1916 about an action in Trones Wood, mentioning young "Nip" Tipping (see Southborough War Memorial for letter). Pte Robert Turner, 8th Middlesex Regiment, son of Mrs Turner, of 14, Norton-road, Southborough, was wounded at Zonnebeek on 2nd of May, receiving a bullet wound in the leg. He is in hospital at Nottingham, and progressing satisfactorily. Pte Turner joined the Army on August 4th. He was in the trenches fourteen days before being wounded. Mrs Turner also has another son serving at the Persian Gulf. From a local newspaper cutting, 1918: Private HF Wiles, son of Mr and Mrs Wiles, of London-road, Southborough, has been wounded. No further particulars are to hand yet, as the only information received was contained in a field postcard dated July 16th, stating that he was wounded and removed to the Base. Pte Wiles, who is 22 years of age, came up with the Derby groups on January 26th, enlisting in the 1st West Surrey Regiment at Dorking. He went to the Front on May 19th. From the Tunbridge Wells Advertiser, 19 April 1918: Mrs Woodhams, of 65, Meadow Road, (Southborough), has received news that her son, Pte G Woodhams, Wilts Regiment, has arrived at the Kitchener Hospital, Brighton, having been wounded by a bomb in both legs and left arm. Pte Woodhams joined up in March, 1917, and went to France exactly a year later. Sidney Woodhams, of the same address, served with the Royal West Kents, from September 1914 onwards.